Total Workshop search results: 24. Displaying Page 1 of your woodworking search phrase CHILDRENS PICNIC TABLE PLANS. Use the free instructions at the link to build a child size picnic table. Link Type: free plans | Link Source: AllThingsWithPurpose | Visit the category | Fix Link? 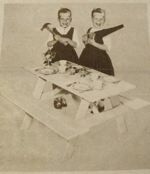 Children enjoy having their own picnic or patio table. This one is easy to build and the pattern has traceable pieces. This is a vintage woodworking plan. Visit our FAQ page for a full definition. View the Larger Image Slideshow to see the actual item you are buying. Build a childrens pirate picnic table using these free woodworking plans. Link Type: free plans | Link Source: ChalkboardBlue | Visit the category | Fix Link? Build a child size folding picnic table for the cottage using these free woodworking instructions. Link Type: free plans | Link Source: CottageLife | Visit the category | Fix Link? Build a child size picnic table with these free woodworking plans. This picnic table is made from construction grade pine so it could be painted, but you can choose pressure treated lumber or cedar if you wish. This picnic table is the perfect size for pint-size friends. Build it using these free downloadable instructions. Coloring in the playroom or a party on the patio is loads of fun with this rugged four-seater table. Built to withstand lots of abuse by kids and Mother Nature, the cedar base supports a smoothly painted tabletop and four seats made from exterior plywood. The table top measures 30 inches diameter. Build this child size picnic table to whatever size you require. Link Type: free plans | Link Source: Woodself | Visit the category | Fix Link? These child size picnic tables seat 4 young kids comfortably and are fun to build using these free downloadable woodworking plans. Build this child size picnic table and benches by following these free plans. Follow these instructions to build this kid-size picnic table.